The Garage storage building provides an abundance of storage space with the added convenience of a roll up style garage door which allows you to store larger equipment. A traditional style walk in door provides additional access, and a 2' x 3' window provides natural lighting. 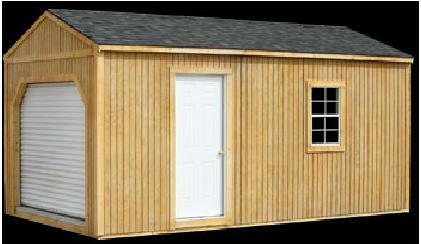 plus you can now "Rent-to-Own" your portable building so you do not need to pay for off-site storage.